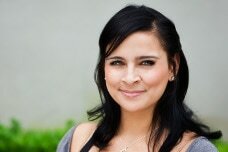 ​Janet Garcia-Mercado is a doctoral student specializing in Learning, Teaching, Cognition, and Development (LTCD) at the University of California, Irvine’s School of Education. Her research interests focus on STEM (science, technology, engineering, mathematics) education. She is particularly interested in researching issues of equity and social justice in secondary STEM education. Janet received her bachelor’s degree in Psychology, with a minor in Anthropology, from California State University, Los Angeles. As an undergraduate, she was involved in psychological research examining the harmful effects of traumatic stressors on psychosocial functioning. Through examining international groups, she gained a perspective on the fundamental issues in conducting mental health research across cultures. To support her research as an undergraduate, she was awarded academic distinctions, including the Sally Casanova Pre-Doctoral Fellowship and the Minority Access to Research Careers Fellowship. Janet’s research interests shifted as a result of tutoring mathematics and science to struggling students throughout Los Angeles. She realized there was a need to change traditional forms of STEM instruction to make learning relevant to students while keeping cognitive demand high. Her research experiences have developed her theoretical understanding of social justice and equity in STEM education. Further, various collaborations throughout school settings have fostered her skills in quantitative and qualitative data collection. In her free time, Janet enjoys traveling, food, swimming and spending time with her loved ones. van Es, E., Mercado, J., Hand, V., C’de Bacca, C., Orsmeth, T., Quiroz, R. Noticing for Equitable Mathematics Teaching. Association of Mathematics Teacher Educators. Irvine, CA., February 2014. Hand, V., van Es., E, Mercado, J. Basile, V. Noticing Practices of Teachers and Students in Equitable Mathematics Classrooms. American Educational Research Association. Philadelphia, PA, April 2014. Mercado, J., Mohr, S., Santagata, R. Elementary Pre-Service Teachers’ Knowledge and Beliefs about Mathematics. National Council of Teachers of Mathematics Conference. Denver, CO, April 2013. Mercado, J., Mohr, S., Santagata, R., Elementary Pre-Service Teachers’ Knowledge and Beliefs about Mathematics. European Association for Research & Instruction. Munich, Germany August. 2013. Santagata R., Mohr, S. Mercado, J. The relationships among knowledge, beliefs, self-efficacy, and career aspirations and satisfaction of U.S. elementary pre-service teachers. European Association for Research & Instruction. Munich, Germany. August, 2013. Garcia, J. & Martinez, M. Approaching Mathematics Through Spatial Temporal Learning. The University of California, Irvine 2009 Research Symposium. Irvine, August, 2009. Garcia, J., Fernando, G., Chan, S., Miller, K. Emotional and Psychosocial Functioning of Sri Lanka Youth Exposed to Traumatic and Daily Stressors. International Society for Traumatic Stress Studies Chicago, IL, November 2008. Fernando, G., Miller, K. Garcia, J., Chan, S. Incidence of Traumatic Exposure and their Impact on Emotional and Psychosocial Functioning Among Children in Sri Lanka. American Psychological Association Convention Boston, MA, August 2008. Fernando, G., Chan, S., Garcia, J., Rocha, L. Predictors of Intimate Partner Violence in a Multi-ethnic College Sample. American Psychological Association Convention Boston, MA, August 2008. Fernando, G., Rocha, L., Garcia, J., Chan, S. Acculturation and Attitudes Accepting of Intimate Partner Violence. Western Psychological Association Convention Irvine, CA, April 2008. Rocha, L., Chan, S., Garcia, J., Fernando, G. Reliability and Validity of Scales Assessing Intimate Partner Violence Among College Students. Western Psychological Association Convention Irvine, CA, April 2008. Garcia, J., Fernando, G. Impact of Demographic, Psychological, and Exposure Variables on the incidence of Intimate Partner Violence Among College Students. CSULA Symposium for Student Research Los Angeles, CA, February 2008. Garcia, J., Rocha, L., Fernando, G. I Reliability and Validity of Scales Assessing Intimate Partner Violence Among College Students. Southern California Conference for Undergraduate Research Los Angeles, CA, November 2007. Garcia, J., Fernando, G., Rocha, L. Reliability and Validity of Scales Assessing Intimate Partner Violence Among College Students. Biomedical Sciences Seminar Series Fall Poster Presentation Los Angeles, CA, November 2007.